This page is mostly for my own benefit, so I can recall the series of computers I've had over the years, and look back to how little memory or how slow the machines were back then. I've forgotten various specs over time, especially on the systems in the late 1990s and 2000s that I didn't have in front of me when I updated the list. The approximate dates listed are when I started using these machines. In many cases the older machines were either still in use as primary machines (say, I only upgraded my Mac or my Windows machine, so I still used the other), were kept for redundancy, or are kept for nostalgia. 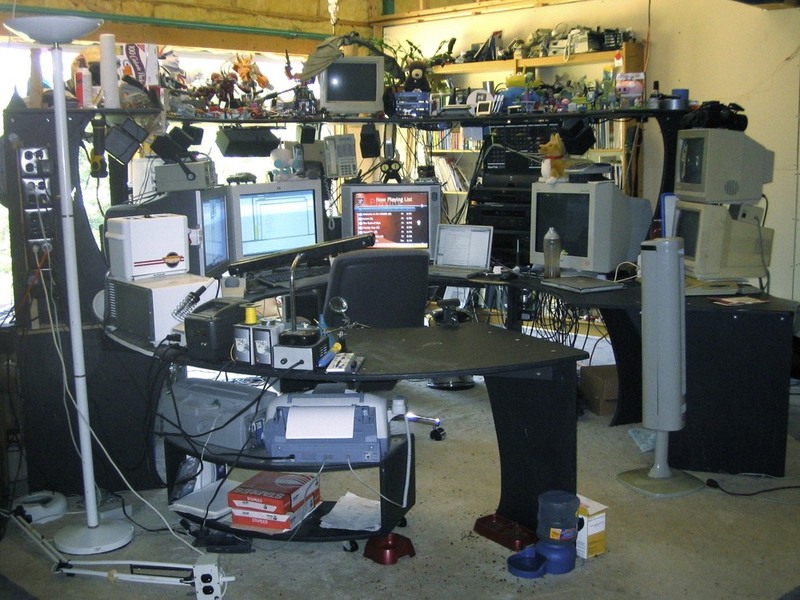 All the old Macs went on eBay, while the PCs were scrapped, sold, or given away. 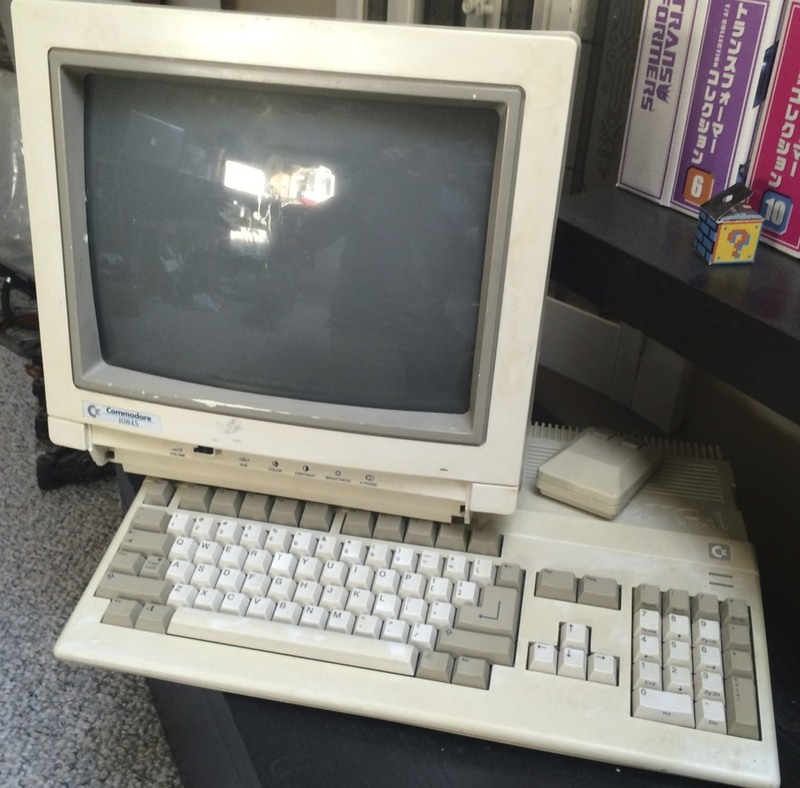 I still have a functional Amiga 500 with monitor, Commodore 64C with monitor and floppy drive, and TI-99/4A with speech synthesizer, plus the current PCs and Macs that I use on a daily basis. My old Commodore 64C with floppy drive and monitor. My old Commodore Amiga 500, mouse and monitor. Around this time I also got a number of other Amigas for cheap or free, including another Amiga 2000, an Amiga 3000, an Amiga 4000, and two more Amiga 500s. A few years later I even found an Amiga 1000 and the original Kickstart disks at a computer recycling event. My main machines were the two Amiga 2000s, one with 60840 card and a Picasso II, and the other with a 68060 and a Video Toaster/Flyer pair. 24 Bit Graphics Card, Ethernet, Basic Sound Card, etc. Still using the Amiga 2000 as well. A folding table with my various computers. This picture is from a bit later than the systems listed on the left, but before I got the ring table. From left to right: Drive In drive tower for the Amiga, two Amiga 2000 computers, DEC Alpha workstation, two Intel based Windows systems. Various Nvidia (GeForce FX 5200), AMD and other brands (FireGL at one point, I believe) of graphics cards, basic sounds cards, 10/100 ethernet, etc. 24" Sony GDM-FW900 widescreen CRTs running at 2304 x 1440 each. Dual 24" Sony GDM-FW900 widescreen CRTs running at 2304 x 1440 each. The ring table was built for a specific room in my old place in California, and another room was built around it in Vermont. Eventually this had to be given up due to lack of space when I eventually moved. In a smaller room, the top shelf and legs of the ring table were repurposed into a new temporary table. This is the first generation of Thunderbolt MacBook Pros. This is the first generation of Mac minis that no longer included an optical drive, but an external SuperDrive worked fine. IKEA GALANT L desk configuration with extensions and a GeekDesk motorized frame, a second desk with fixed frame as an electronics workstation electronics, and a third for 3D printers and such. 15" Dell XPS laptop, 30" Dell monitor, 16:9 and 21:9 monitors, and 15" MacBook Pro, with Mac mini and drive enclosures under the desk. Also my cat, Neko. Mac mini, Airport Extreme and four drive enclosures configured as mirrored RAIDs. Electronics work area to the left of the computer desk. This laptop was purchased with an eye towards driving the UHD display; the fast CPU, SSD and extra RAM were a bonus. 17" MSI Laptop, 50" UHD, 27" 16:9 and 29" 21:9 monitor stack, 15" Thumderbolt MacBook Pro. Mac mini and the OWC Thunderbay IV quad drive enclosure with larger drives that replaced the four older enclosures. Curved 55" Samsung UHD TV running at 3840 x 2160 at 30 Hz. The TV is capable of 60 Hz at that resolution, but the NVidia GTX 765M has to compromise visual fidelity to run at that refresh rate. From left to right: MSI laptop, 55" curved TV, Mac mini monitor (top; the Mac mini itself is under the desk), iMac (bottom), LG Ultrawide, MacBook Pro.